There are many good goalkeepers out there who struggle with the correct timing and technique when it comes to catching crosses and high shots. This drill should help you out. The goalkeeper is positioned in the middle of the goal. He runs towards the post. As soon as he touches it the coach throws a high ball which the keeper tries to catch. Important: Do not run backwards. Try to move sideways crossing your legs. It’s also important that you jump off with the correct leg (the one that is closer to the goal). Also, don’t move towards the ball too early. You should always expect a long ball, because moving forward is much easier than moving back. You can use dummies, players or other goalies as (non active) strikers. Filled with highly effective goalkeeping drills that should be part of any professional goalkeeper training routine. 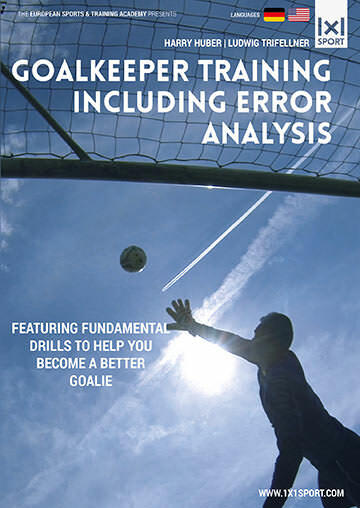 Learn how to detect, prevent and correct errors you goalkeepers make. Raise your goalkeeping skills to a new level with drills developed by experts from the country with the highest number of world-class goalkeepers. Optimize all aspects of your game and become an insurmountable obstacle for any opposing player out there!